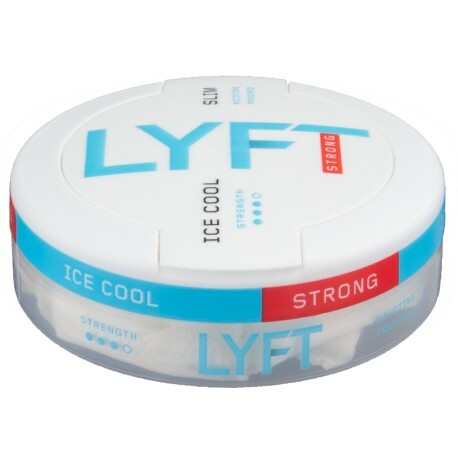 LYFT Strong Ice Cool Mint Slim All White portions are high nicotine flavorful mint pouches. From the makers of EPOK, instead of using white tobacco like EPOK, fiber from eucalyptus and pine is used. Aside from the nicotine which is extracted from tobacco, this is an all white tobacco-free product. If you love the taste of Epok Strong Ice Cool Mint All White Portion, you'll find it here! The only significant difference between LYFT and EPOK is the filler. EPOK takes tobacco and washes (more like water boarding it) into a clean white unflavored powder. One day BAT said "why are we washing out tobacco when we can just use pulverized non-tobacco fibers for the filler!" And so LYFT was born! Aside from the fibers used and the name, LYFT is indistinguishable from EPOK right down to can! In fact, LYFT is replacing EPOK which will be retired. The only difference I, Moe Unz, could taste between the two brands was a slight burn with LYFT which was sadly missing in EPOK. Enjoy! The nicotine is the same as epok. It's great the only difference I noticed was the mint seemed to have a cool burn. 2 out of 3 people found this review useful.